The Game Bag | They Might Be Gazebos! This is my burden and the inspiration to redo the $20 Dungeon. Why because it’s gotten too damn big with too much stuff. 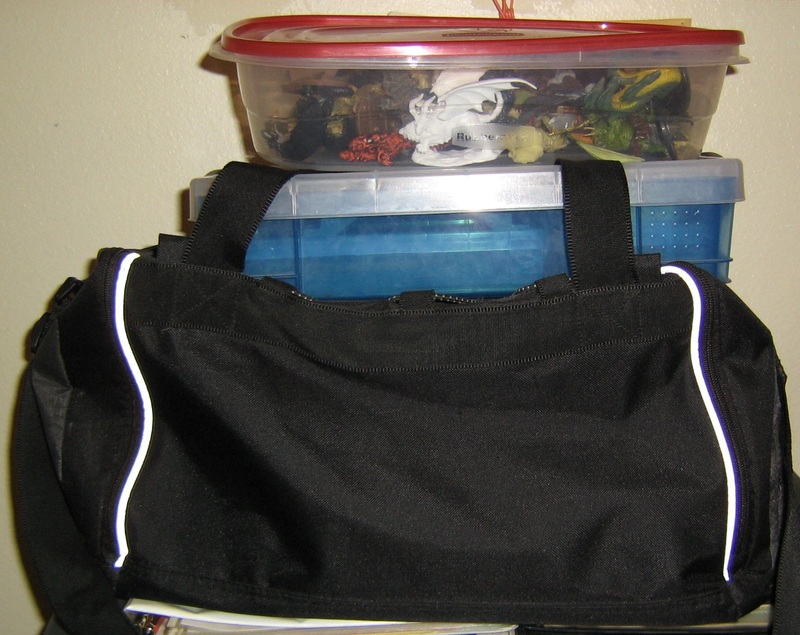 This bag and those two plastic containers on top are just mini’s and miscellaneous terrain/map bits. That’s right no dice, no rule books, no notebooks. Juggling this stuff when it’s time to run a game is just too dang annoying and cumbersome. It’s cool to have all sorts of stuff handy when you’re running a game at home but when you’re on the road, you travel lighter and if you’ve gaming for a while you start to accumulate lots of little bits and accessories. This goal of this post is to get a starting point and start thinking about what to cut out. What’s duplicated, what I don’t need and things are multi-taskers. My main goal (to start) is pare this down so everything fits inside the bag. Like I said before, I’m getting to switch from Dungeon Crawl Classics to Sharp Swords and Sinister Spells and then after that it’ll be a little Swords & Wizardry White Box. It’s going to be fun and a little bit crafting projects coming up.